I know a moment later what she means. The horses’ hooves are striking the ground, vibrating the gravel beneath my knees. I look to the brush beside us and quickly consider dragging Metea into it, but the horses are too close. If I’m going to save myself I don’t have time. “Get up!” I am crying now. The salty tears blend with my sweat and burn my eyes. Even as I say it I’m rising, hooking my arms beneath hers, pulling her back against my chest. But she’s dead weight and I collapse. She rolls limply to one side. I kiss her cheek, and hope she knows that I love her. I will sing Bian’s soul to the next life. I will sing her soul there too, because she surely is doomed to his same fate. “Run,” she says one last time, and I release her. I sprint due north, the opposite direction from the cave where I hope Salma has hidden the twins. I run as hard and as fast as I can, fueled by fear and hatred. My feet barely graze the ground for long enough to propel me forward, but still I can feel the earth tremble beneath them. The Trackers are coming closer. The Magnate is right on my heels. I dodge in my zigzag pattern. I spin around the pine trees and barely feel the gray bark as it nicks my arms and legs. My hide pants rip near the knee when I cut too close to a sharp rock, and I know that it’s taken a hunk of my skin, too. No time to check the damage, no time for pain. I hurdle over a stream-bed and continue to run. A break in the noise behind me, and I make the mistake that will cost me my freedom. They are close. So much closer than I thought. Two horses have jumped the creek. They are back on the bank now, twenty paces behind me. I catch a glimpse of the tattered clothes of the Trackers, and their lanky, rented geldings, frothing at the bit. The faces of the Virulent are ashy, scarred, and starved. Not just for food, but for income. They see me as a paycheck. I’ve got a credit sign tattooed across my back. I run again, forcing my cramping muscles to push harder. Suddenly, a crack pierces the air, and something metal— first cold, then shockingly hot—winds around my right calf. I cannot hold back the scream this time as I crash to the ground. The wire contracts, cutting through the skin and into the flesh and muscle of my leg. The heat turns electric, and soon it is shocking me, sending volts of lightning up through my hips, vibrating my insides. My whole body begins to thrash wildly, and I’m powerless to hold still. The pressure squeezes my lungs and I can’t swallow. I start to pant; it is all I can do to get enough air. A net shoots out over me. I can see it even through my quaking vision. My seizing arms become instantly tangled. “Release the wire! Release it!” orders a strident male voice. A second later, the wire retracts its hold, and I gasp. The blood from my leg pools over the skin and soaks the dirt below. But I know I have no time to rest. I must push forward. To avoid the meat market, to keep my family safe, I must get away. I begin to crawl, one elbow digging into the dirt, then the next. Fingers clawing into the mossy ground, dragging my useless leg. But my body is a corpse, and I cannot revive it. Mother Hawk, I pray, please give me wings. But my prayers are too late. My voice is only a trembling whisper, but I sing. For Bian and for Metea. I sing as I push onward, the tears streaming from my eyes. I must try to set their souls free while I can. Out of the corner of my eye I see the boney fetlocks of a chestnut horse. The smooth cartilage of his hooves is cracked. This must be a rental—the animal hasn’t even been shod. An instant later, black boots land on the ground beside my face. Tracker boots. I can hear the bay of the hounds now. The stupid mutts have found me last, even after the horses and the humans. I keep trying to crawl away. My shirt is soaked by sweat and blood, some mine, some Metea’s. It drips on the ground. I bare my teeth, and swallow back the harsh copper liquid that is oozing into my mouth from a bite on the inside of my cheek. I am yelling, struggling against my failing body, summoning the strength to escape. “Exciting, isn’t it boys?” I hear a man say. The same one who ordered the release of the wire. He kneels on the ground and I notice he’s wearing fine linen pants and a collared shirt with a tie. If only I had the power to choke him with it. At least that would be vengeance for one death today. His face is smooth and creaseless, but there’s no fancy surgery to de-age his eyes. He’s at least fifty. He’s wearing a symbol on his breast pocket. A red bird in flight. A cardinal. Bian has told me this is the symbol for the city of Glasscaster, the capitol. This must be where he plans on taking me. He’s ripping the net away, and for a moment I think he’s freeing me, he’s letting me go. But this is ridiculous. I’m who he wants. Then, as though I’m an animal, he weaves his uncalloused, unblistered fingers into my black, spiraled hair, and jerks my head back so hard that I arch halfway off the ground. I hiss at the burn jolting across my scalp. He points to one of the Trackers, who’s holding a small black box. Thinking this is a gun, I close my eyes and brace for the shot that will end my life. But no shot comes. “Open your eyes, and smile,” the Magnate says. With his other hand he is fixing his wave of stylishly silver hair, which has become ruffled in the chase. I do open my eyes, and I focus through my quaking vision on the black box. I’ve heard Bian talk about these things. Picture boxes. They freeze your image, so that it can be preserved forever. Like a trophy. I’m going to remember this moment forever, too. And I don’t even need his stupid picture box. 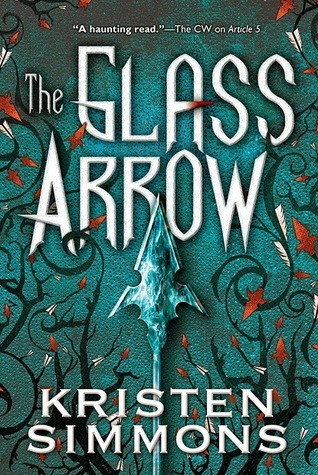 Excerpted from THE GLASS ARROW © Copyright 2015 by Kristen Simmons. Reprinted with permission. All rights reserved. 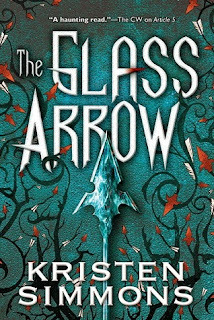 Kristen Simmons is the author of the ARTICLE 5 series (ARTICLE 5, BREAKING POINT, and THREE), THE GLASS ARROW, METALTOWN, PACIFICA (coming March 2018 from Tor Teen), and THE PRICE OF ADMISSION (coming Fall 2018 from Tor Teen). She has a master’s degree in social work and loves red velvet cupcakes. She lives with her family in Cincinnati, Ohio.